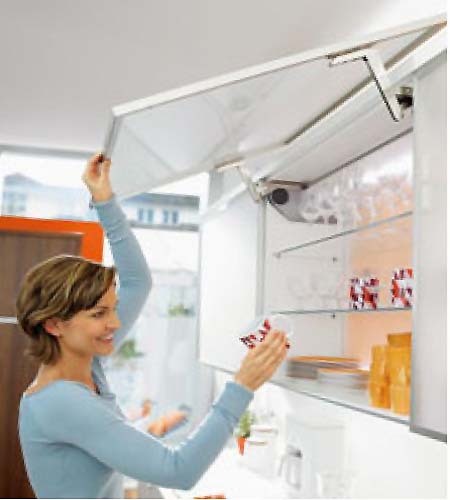 Blum Aventos Kitchen Lift door systems are the answer for unhindered access to Kitchen overhead cabinets. 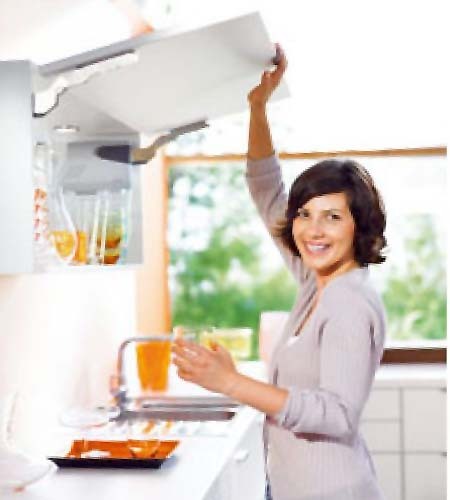 Choose the right Lift system for your next Kitchen design or renovation. Blum Aventos Kitchen Lift Door systems not only provide better access to kitchen cabinets but also assist to create the illusion of a longer kitchen by introducing horizontal line to your kitchen design. 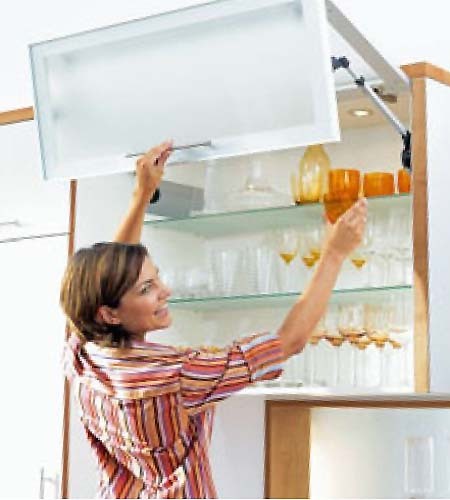 Ideal for higher wall cabinets because the handle remains easy to reach in any position. Due to the two-part front, the space requirement at the top is low for very high cabinet heights. Ideal for applications in high or wall cabinets with fronts above as well as recessed cabinets. Well-suited for small-area, single fronts. Ideal for large-area, single fronts. Space requirement above the cabinet is minimised due to highly engineered movement. You can also use cornice or crown moulding with AVENTOS HS. Ideal solution for low cabinet heights in the wall cabinet. AVENTOS HK requires only a small amount of space at the top due to the pivot action. Ideal solution for small cabinets, e.g. over the larder unit or refrigerator. AVENTOS HK-S requires only a small amount of space at the top due to the pivot action. With the SERVO-DRIVE for AVENTOS electrical motion support system, the use of lift systems is turned into a special experience: Whether a bi-fold lift system, up & over lift system, lift up or stay lift – a light touch on the front for opening and a simple press of a button for closing is all that’s required. SERVO-DRIVE for AVENTOS – opens and closes automatically.